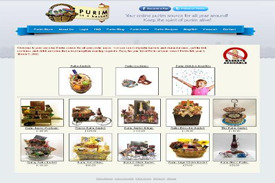 This website,one-stop Purim resource for all purim needs.Purim offers purim baskets ,purim gift baskets,mishloach manot,shalach monos, kids costumes and purim shtick and even local megillah readings on purim. The internet is the biggest shopping center in the world, so if you have a product or information for sale, this is the place to be. An E-commerce Website Design allows anyone the ability to reach an unlimited amount people and display their wares, with easy self maintenance. With an E-commerce Website Design, a customer can view and purchase items by simply completing a form and using their credit card. You need not pay a sales person or rent. Who can ask for anything more!One-stop Purim resource for all your purim needs. You can send out purim baskets and shalach monos, get the kids costumes and shtick and even find local megillah readings on purim. Enjoy the yom tov of Purim all year round! Purim this years is March 8, 2012.